You know this thing about Miss Hokusai Games? Miss Hokusai Games is the name of one of our most recent categories to be based on a Japanese animation, the feature film with the same name depicting a wonderful story of a famous painter and his not-so-famous daughter. We are sure that you will be able to enjoy all the Miss Hokusai Games on this page, so give them all a chance, right now! In Miss Hokusai Games you can find 2 games that we've published for these kids and childrens that are interested to play Miss Hokusai Games, this game gategory have been created on 15.09.2016. These games with Miss Hokusai Games have been voted 1 times and the avarage of vote is 5.00 stars. We advice you to play the last flash game from Miss Hokusai Games, Miss Moon Hidden Stars that have been published on 17.09.2017 00:00. 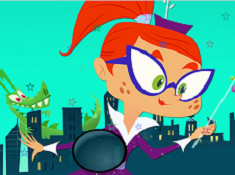 Miss Moon Hidden Stars its a part of Miss Moon Games category and until now its played 469 times. Try it now on Cute-Games.com! Miss Hokusai Puzzle its a part of Miss Hokusai Games category and until now its played 578 times. Try it now on Cute-Games.com! 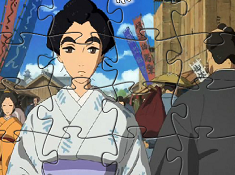 If your like the Miss Hokusai Puzzle game you can write a comment in the game page. Recommend this game to your friends if you like it! Find More About Miss Hokusai Games! Our administrative team here at www.cute-games.com is always trying to expand our website, making sure we have as many diverse categories as possible, with games based upon media like cartoons, live-action tv shows, animated movies, live-action movies, comics, video games, but also things like anime or manga, which is the case for the Miss Hokusai Games category, one of the newest categories of games that we have added for our website. For those of you who do not know, the Miss Hokusai Games category is based on the 2015 anime film of the same movie, which in turn is an adaption of the manga series called Sarusuberi, which both follow the life of Hokusai, who is was one of Japan’s most celebrated painters in history, but the manga and the movie both focus more of the untold story of his daughter, who seemed to have inherited her father’s gift for painting, but also his talents. It is a fantastic anime film which has an incredible animation, befetting the artist it celebrates, with a very interesting story and great characters, so it is absolutely no wonder that the film has won numerous awards at different festivals dedicated to animation and film in general. The movie was released in Japan in 2015, but North American audiences and a great number of other countries in the world are going to get to watch the movie in theaters this October, which is why we waited until 2016 to create the Miss Hokusai Games, knowing very well that this will be the time when fans of the movie who will watch it for the first time are going to be looking for these games. Of course, we hope that we made the ones who have already seen the film very happy as well with the addition of this category, and we will only make them even more happy when they are going to play the Miss Hokusai Games which can be found and played for free right on this page! Of course, we realize that many of you would like to know more about the film before you start to play Miss Hokusai Games, which is why in the following part of the description we are going to give you a short synopsis of the movie and it’s main characters. If you don’t think you need that information at all, then, of course, we invite you to start playing the games right now, but for the rest of you, keep reading and you will discover a lot about the movie this category is based upon. The film takes place in 1814 in Edo, now known as Tokyo, which even then was a city filled with numerous people of all kinds, even supernatural spirits some may say. Tetsuzo, in his mid-fifties, is one of the country’s best painters, who can paint incredible things, and works tirelesly for any projects, and he does not care for money, but he charges high sums for projects that he is not passionate about. O-Ei, his third daughter from his second marriage has inherited her father’s talent and stubbornes, and she has painted many of his project, even is she was not credited. Tetsuzo was going to be found decades later by Europeans and admired by everyone, by the name Katsushika Hokusai, but this film sees the story of his daughter, who was a lively character and who lived in the shadow of her father, helping him craft many of his masterpieces, even though she did not receive any credit in her lifetime. She always assisted her father and contributed greatly to his art, making her a very interesting characters. We are sure that all those of you who are going to watch the film, whether in theaters, on television, or on your computers, you are going to enjoy this heartwarming story about art, passion and life very much, since this is without a doubt one of the best animated movies to come from Japan this year. That is why we have a lot of faith that you will also be interested in playing Miss Hokusai Games, a category of games which so far includes a very fun to solve jigsaw puzzle game depicting the main character. Of course, like with all categories, when the movie is going to be released, we are sure that the number of games based on it is also going to increase, and that you will all love playing the games here! Well, we finish this description by telling you once again that we think that the Miss Hokusai Games is a great addition to our website, and we want to recommend you all the games on this page. Like with all games on our website, these are also a lot of fun, so what are you waiting for? Start them right now, and get playing!